BLOOM's interface is easy to use and its features include all the essentials for managers to establish consistent credibility and alignment with their team members. Each team member has access to their personalized dashboard when they log in. Team members can instantly access their development goals, activities, performance dialogues, role expectations and training and strategic assignments due in the next 30 days. Depending on security level, managers and executives can also instantly access team member's information for monitoring activity and performance progress. The Dashboard news feed allows your organization to view the latest news, information and events in real-time. Recognize team members for their hard work and let your organization engage with one another through positive reinforcement and comments. Easily access open individual goals, learning activities, resource links, and more within the dashboard items due section. Assign learning activities to roles or team members, track learning hours and scores, and most of all - prove that you value the development of your people. Team members can define personal goals for professional development and improvement. These goals can be weighted and integrated into the performance review to make sure individuals are reaching their full potential. Show your team members that you value them and are willing to invest in their development. Create activities of any kind including: policy and program sharing, learning classes and programs, and links to surveys and learning management tools. Assign them as role requirements or to individual team members. Track individual learning hours and scores to ensure that every team member has up-to-date talents and skills. 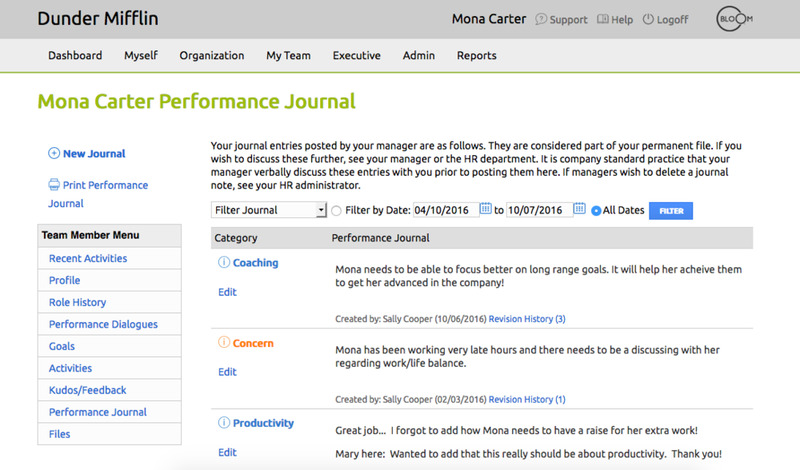 Personalize performance dialogue forms for each team member and evaluate progress on role key results areas, competencies, weighted individual development goals, learning assignments, organization core values and more. Create performance dialogue forms for each team member based on personalized role requirements, goals, activities and assignments that you define. Every dialogue form is based on measurable requirements that you select. Personalized information from team member records can be pulled directly from their role requirements, development goals, activities and learning assignments. This makes it easy to see an individual's performance, areas for improvement and fit for the position. Custom dialogue forms can be created by HR and selected by managers for purposes such as coaching, progress discussions, career achievement review and annual performance reviews. From the dashboard, any team member can post a public kudos or private feedback for any fellow team member in the organization. This feature is excellent for capturing mentoring, job shadowing, train-the-trainer and team perceptions feedback. 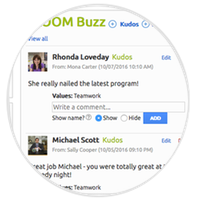 Kudos comments are streamed on the company dashboard for all to see, while private feedback is accessible only to the team member and direct manager. 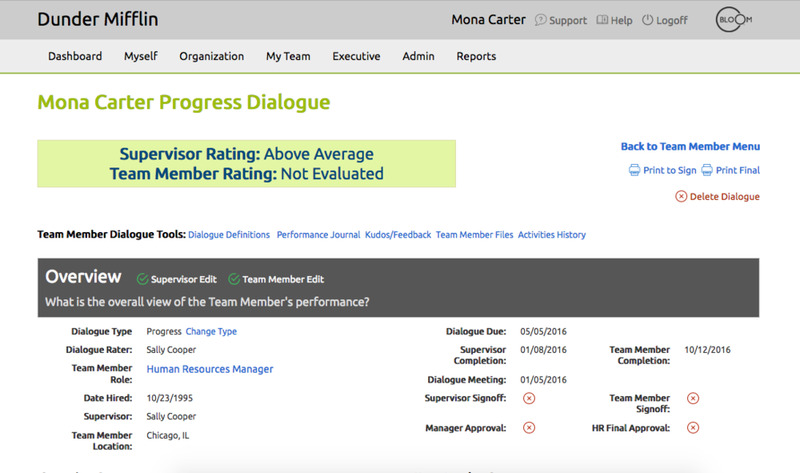 Each team member's kudos and feedback is accessible in their individual record, as well as, performance dialogue forms. Once a public kudos is posted, other peers can comment on the kudos to demonstrate recognition and support. On a daily or weekly basis, managers can post team member performance accomplishments and incidents in a journal that automatically date stamps the time of entry. This feature is easy and great for accumulating reference documentation required throughout the performance planning process. Add unlimited links and documents to the information center. Share forms, policies, procedures, and more in categories that you customize for your organization. BLOOM offers a comprehensive information center where you can upload unlimited company files such as policies, forms, procedures, images and links to other websites for team member access. Connect your employees to the purpose of the organization. Create unity by assigning defined strategic growth goals, objectives, strategies, and tactics to lead your team to success. Develop organization goals, objectives, strategies and tactics and post them in BLOOM where assigned team members can edit and post progress notes and files. Track deadlines, budgets, and percentage of completions. Growth plans fully integrate into individual performance tracking. Easily and quickly manage role profiles, team member role histories, role change requests, and wage analysis with a click of the mouse. For each role, enter competencies, skills, proficiencies, education, required learning, and customizable KRAs (Key Result Areas). The result is a role profile with a uniform format across departments -- not just an uploaded Word document where its information is not accessible to integrate with other parts of the system. Define KRAs (Key Results Areas) for each role as essential requirements -- such as KPIs (Key Performance Indicators) for success. Consistency in pay across your organization starts with the creation of wage scales that can comprise of one or multiple levels of ranges of base compensation with required skills and abilities. 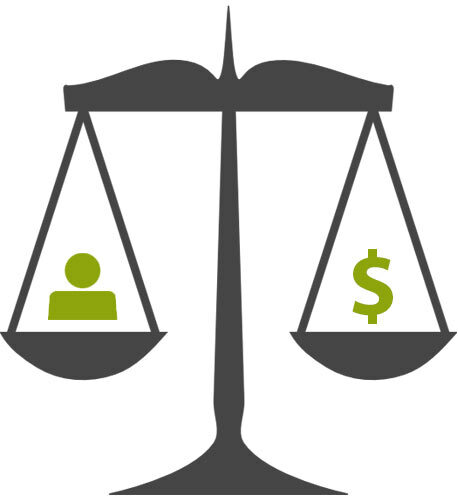 Wage scales are then assigned to roles to set the range of pay for each position.